WASHINGTON — The nation’s top health authorities agree: Teen vaping is an epidemic that now affects some 3.6 million underage users of Juul and other e-cigarettes. But no one seems to know the best way to help teenagers who may be addicted to nicotine. E-cigarettes are now the top high-risk substance used by teenagers, according to the latest U.S. figures , which show that Juul and similar products have quickly outpaced cigarettes, alcohol, marijuana and other substances that have been tracked over more than four decades. Kicking any addiction requires discipline, patience and a willingness to follow a treatment plan — something that doesn’t come easily to many young people, experts said. Tanski and other experts will meet this Friday at the Food and Drug Administration to discuss the potential role for pharmaceutical therapies and non-prescription medications such as nicotine gums and patches. Regulators acknowledge they are starting from square one: The FDA “is not aware of any research examining either drug or behavioural interventions” to help e-cigarette users quit, the agency noted in its announcement. The FDA will also hear from researchers, vaping executives, parents and teenagers. “We want to make sure our voices are heard and that — most importantly — our kids’ voices are heard,” said Meredith Berkman, who plans to speak at the meeting with her 10th-grade son. Berkman said she first realized her son and his friends were “Juuling” last year when she heard them repeatedly opening and closing his bedroom window. With two other New York City mothers, she formed the group Parents Against Vaping E-cigarettes, which is asking the FDA to ban all e-cigarette flavours. 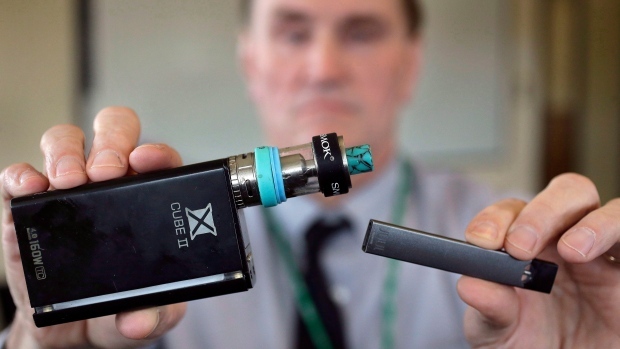 “Unless the flavours are off the market, kids are going to continue to be seduced by these highly addictive nicotine-delivery systems like Juul,” Berkman said. Quitting smoking is notoriously difficult, even for adults with access to various aids and programs. More than 55 per cent of adult smokers try to quit each year, yet only about 7 per cent succeed, according to government figures. Nicotine gums, patches and lozenges are available over-the-counter for those 18 and older, and are occasionally prescribed “off-label” for younger patients. They provide low levels of nicotine to help control cravings. Prescription drugs include Zyban, an antidepressant, and Chantix, which blocks the effects of nicotine on the brain. But neither has shown positive results in teenagers, and both carry worrisome side effects, including suicidal thinking for Zyban and nausea and abnormal dreams for Chantix. That leaves counselling as the go-to option for teenagers trying to quit cigarettes. In November, Colorado dropped the minimum eligibility age for its quit-smoking hotline from 15 to 12, in response to the explosion in vaping among students as low as 6th grade. The state’s underage vaping rate is the highest in the U.S., with 1 in 4 high school students reportedly using the products, according to federal data. The state’s over-the-phone and online programs provide free coaching to help users create a quit plan, manage cravings and avoid relapse. But even counselling has shown only “limited evidence” in helping teenagers, according to an exhaustive review of the medical literature published in 2017. Addiction psychiatrist Jonathan Avery says he gets four to five calls a week from pediatricians referring patients or asking about treatment options. One of the biggest problems is an education gap — many doctors haven’t heard of Juul and don’t even recognize the vaping devices brought in by parents. On the other side, teenagers are often “suspicious” when he informs them that they are inhaling a highly addictive substance, said Avery, of New York-Presbyterian Hospital. The U.S. Surgeon General, Jerome Adams, hammered that point home in a rare public advisory last month. He said even his 14-year-old son believed that e-cigarette vapour was essentially harmless. “Youth like my son have no clue what’s in these products most of the time,” he said.